One of the advantages of belonging to a pious, religious family is that you get to visit temples everytime you travel with family. My mom recently came to spend a few days with me in Mumbai – where I’ve recently moved in. Needless to say, a visit to the Siddhi Vinayak temple was on our list of ‘places to see’ before she left the city. The idea of the construction of the temple struck to Late Mrs. Deubai Patel during the prayer time, she humbly requested Lord Ganesh and said, “Although I cannot have a child, let other ladies who are childless get the pleasure of child on visiting the temple and praying you”. Looking at successful subsequent history of the temple, it appears like the Lord Ganesh nodded to this humble request and pious thoughts and deeds of Late Deubai Patil. 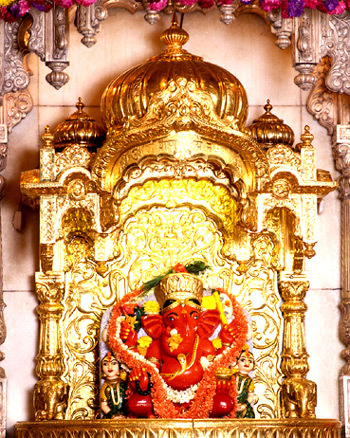 It is, therefore, this Siddhivinayak is famous for it and known as “Navasacha Ganapati” or “Navasala Pavanara Ganapati” in Marathi (Ganapati bestows whenever humbly genuinely prayed a wish) among devotees. In many cases, the “popularity” of a place of worship depends on who (and the ‘whos who?’) has visited that temple. For instance, the imagery of Amitabh Bachchan and family visiting the Siddhi Vinayak Temple has been so deeply etched in the minds of the God-fearing section of the Indian populace, that (in many ways), the identity of the place itself is synonymous with the Demi-God of Indian Cinema. In fact, the taxi driver who drove us down to the temple couldn’t stop speaking about the crowd and media-following that Amitabh (& family) got when decided to talk down to the temple from their place in Juhu. So much for Gods and Demi-Gods.. Yet it is these anecdotes of a rich heritage and a proud culture that keeps us going. Previous Previous post: The 3 L’s of Kottayam!